Is it the Curse of the Campshaws, or does everyone with a camper/trailer/RV have the same crappy luck we seem to have? In the (less than) three years we’ve owned our T@DA, we’ve replaced the batteries (twice), the converter which converts 110V to 12V, tires, refrigerator, and the arms which hold the windows open. We also managed to blow up our microwave (the Texas Enchilada Incident). Our license plate broke off, twice(!) on the road somewhere. Oh, and let’s not forget the brake/bearing fiasco which dogged us in Louisiana two years in a row. I dunno – seems like a lot to me. Maybe every camper has this stuff. But, we love the Fireball. It becomes a bit of a hobby to check out other campers. Truthfully, we haven’t found anything that we would rather own, including the Airstreams that everyone covets. So, when we noticed that we have some spongy spots in the floor, we knew that we’d have to figure out a way to get things repaired. And, since I’ve lusted for a marmoleum floor since seeing on in a restored Spartanette a couple of years ago, it seemed like a good time to replace our dingy whitish floor as well. How lucky is it that my brother-in law’s brother in law (are you following?) works part time for a gentleman who collects vintage Airstreams. And, he lives right here in Grand Rapids! Ken (the Collector) owns a huge service garage where he stores his collection of amazing trailers. He employs a couple of guys full time who do nothing but work on restorating these classic beauties. With a proper introduction, the guys investigated, and decided to take on the Fireball as a ‘side’ project. Mike, the Head Repair Guy, crawled around beneath the Fireball, and felt that we had ‘floor fatigue’, as opposed to rot, causing the sag and squishy spots. The cure? Brace the floor from underneath in two spots. Photo shows new brace. On additional brace is barely visible. About four hours after dropping the Fireball off, we got a call saying “you better come see this”. (Campshaw Curse running at full speed now). Removal of the old vinyl floor revealed a sodden plywood base. Not rotted, but thoroughly soaked. Scary, isn’t it? Mike and Jim removed all the interior fixtures – and found that the damage seemed to originate under the KoolCat, which is the electric heater/air conditioner. How often do we use the a/c? Oddly, that was a very easy question for us to answer…(one day two years ago in Death Valley, and two or three days on our most recent trip.) We discovered that the construction of the T@DA didn’t allow the water collected by the air conditioner to drain out. Instead, it ran from the drain hoses, back under the a/c unit, and directly into the floor. “It’s a good thing I’m seeing this trailer now, instead of a year from now,” was Mike’s comment. An additional area where water must have collected was under our side storage panel. Mike built a metal pan with about two inch sides to surround the KoolCat. It’s screwed and glued in place. The drain tubes now poke through the protective screen, and will drain out to the ground. We also have a shield over the screen to keep water and road dirt out of this area when we tow. See the drain tubes poking out on the lower left and lower right corners of the grille? Repairs are now complete, and the floor is installed. Looks great, doesn’t it? Furniture is reinstalled, and it’s done. Finished!! We’re fortunate to have found folks who had the technical expertise and the willingness to tackle this project for us, as it certainly was beyond our own do it yourself capabilities. The original $600 estimate ballooned to $1600, but we know that we’re roadworthy. Hoping that this is the end of the Curse…. One last modification that John accomplished was to install a new battery box with two 6V golf cart batteries to replace our two marine deep cycle Group 24 batteries. This should give us much more boondocking time off the grid. We’re excited about this. We are ready to hit the road. Whew! Really, Pennsylania? The Grand Canyon? Hardly. 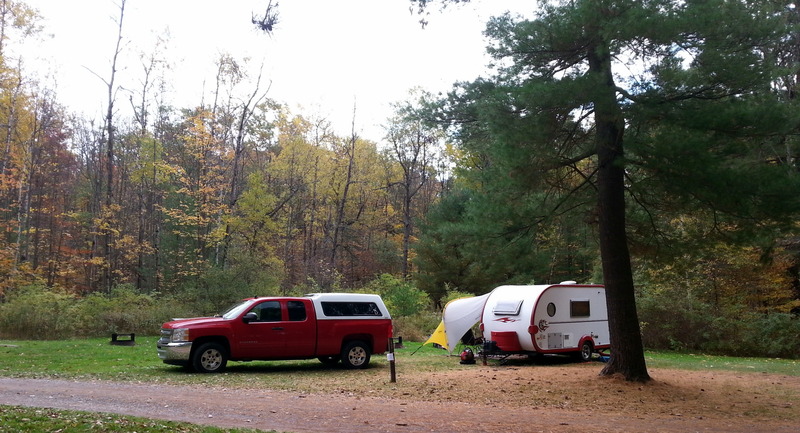 Some of our most favorite spots are places that have been recommended to us by fellow campers. 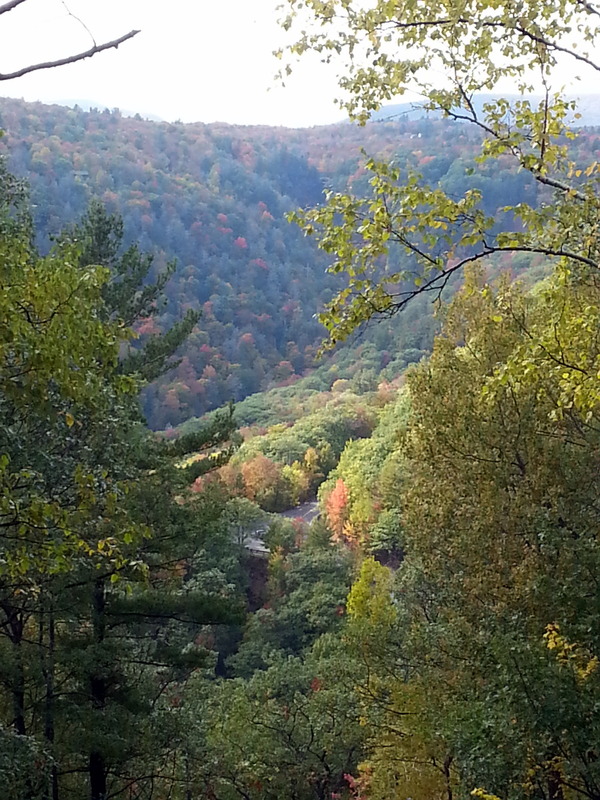 That’s how we found ourselves headed to Wellsboro, home of The Grand Canyon of Pennsylvania. Leonard Harrison State Park is located there, so we take a chance that there will be an open campsite, being that it’s midweek. 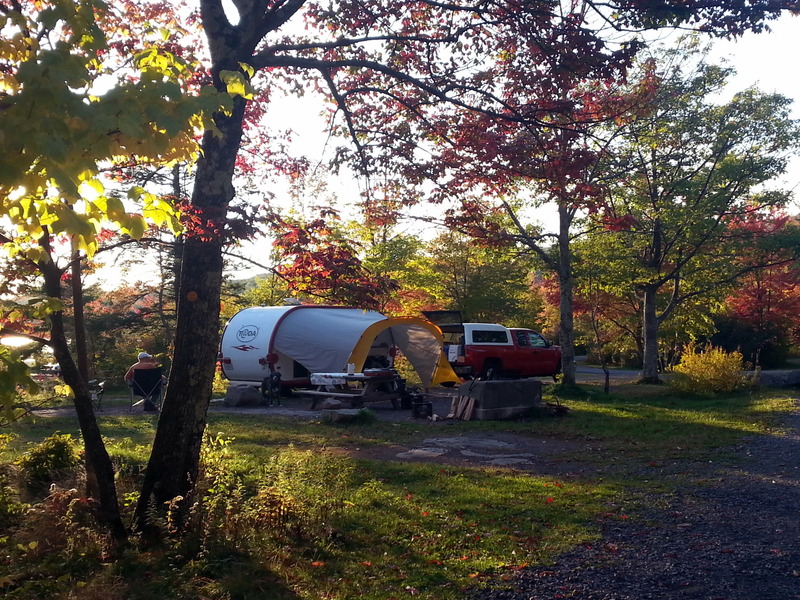 Although this is a tiny little campground, there was no trouble getting a spot – altough once again, there was no electric power, no water, and no phone signal. 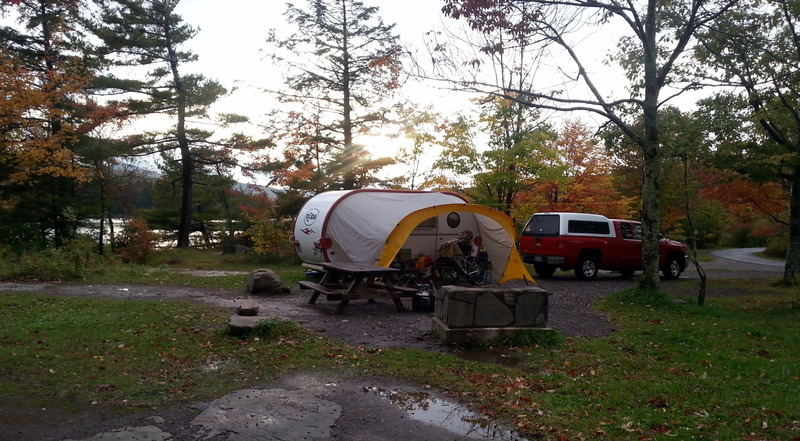 Three nights seemed to be the magic number – a day to get set up, a day to hike, and a day to bike. A word to those traveling with pets who camp. We’ve found out that State Parks in CT don’t allow dogs in the campground. 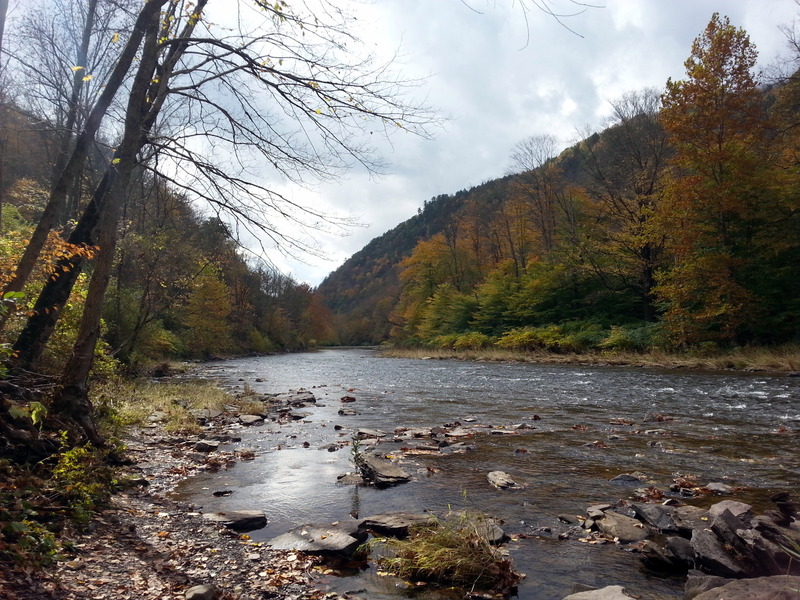 State Parks in PA do allow dogs, but only in restricted areas. We had a choice of just two sites. So, check in advance, and reserve a site when you have to. Fall colors seem to have already come and gone here. 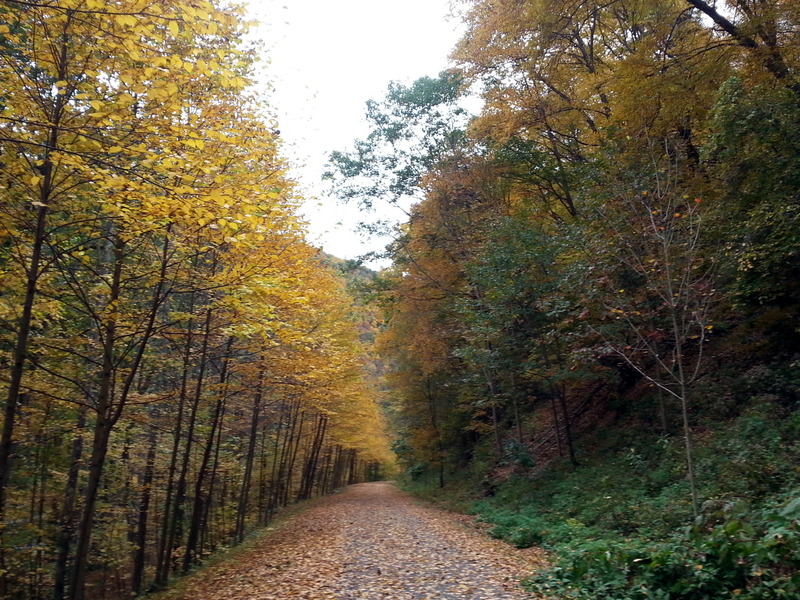 There are a few golden maples hanging around, but everything is kind of a grey, cloudy Here Comes Winter kind of color. We decide to hike with Jezzy to the bottom of the Canyon, down a fairly steep trail. The only difficulty was that it had rained in the night and early morning, causing the wooden steps along part of the trail to be very hazardous. We crept along like geezers, clutching the railing, and trying to keep our boots on the ground. 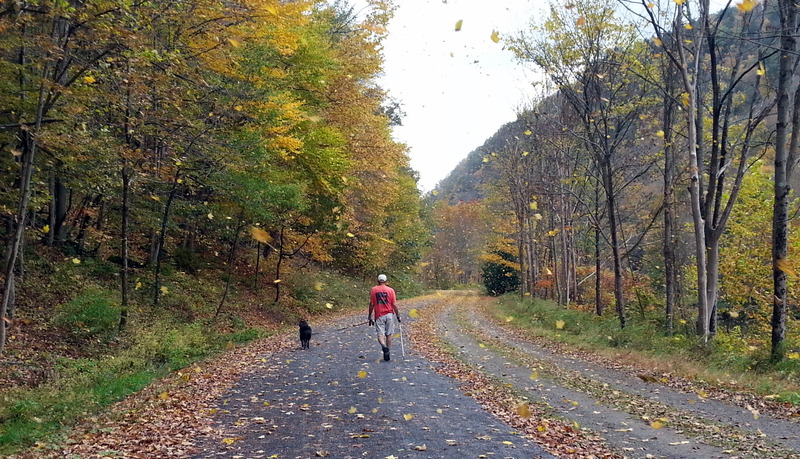 At the bottom, we encountered a blizzard of falling leaves – the photo really doesn’t quite capture how many of them were whirling around our heads. 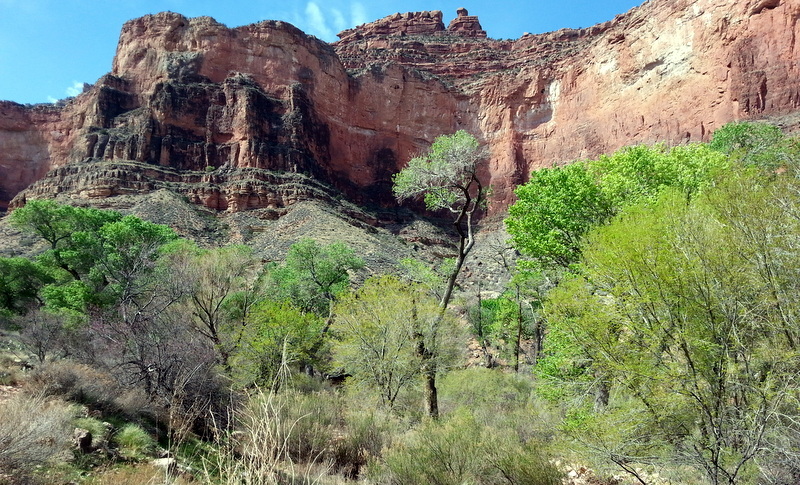 The bottom of the Canyon, along the Pine Creek, is about 600 feet from the top – a pretty view, but not really worth of the moniker Grand Canyon. Two years ago, we visited the Grand Canyon of the East in New York, and found that to be a more appropriate name. 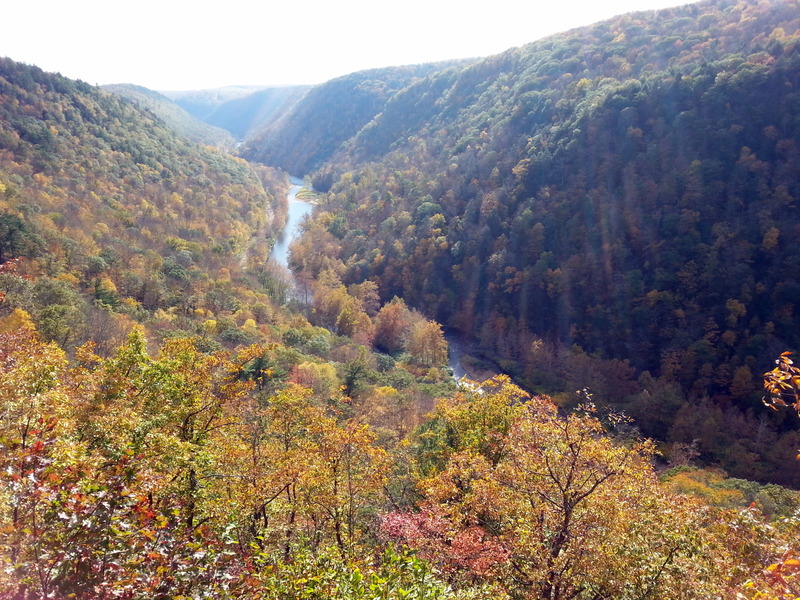 But, John googled Michigan Grand Canyon, and came up with this, so I guess Pennsylvania looks pretty good after all. 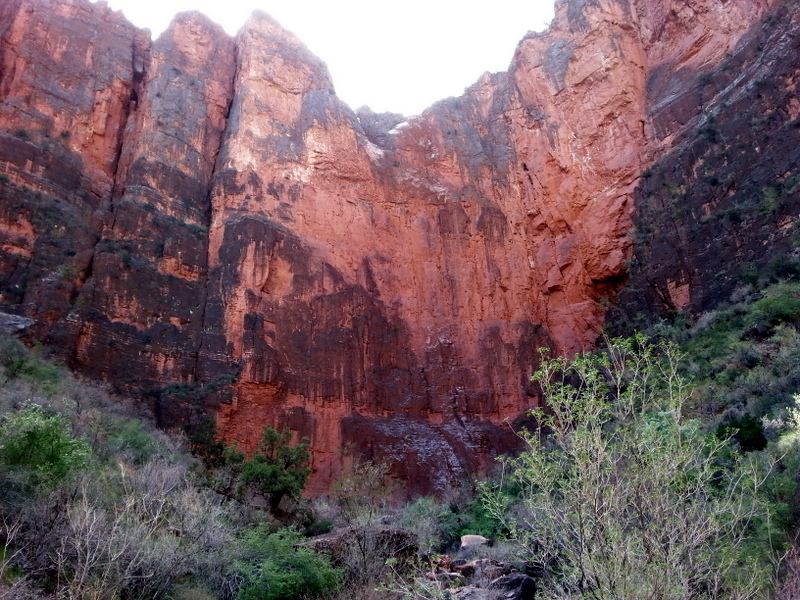 The Pine Creek Trail runs for 60 miles long the bottom of the canyon. Perfect for a bike ride. 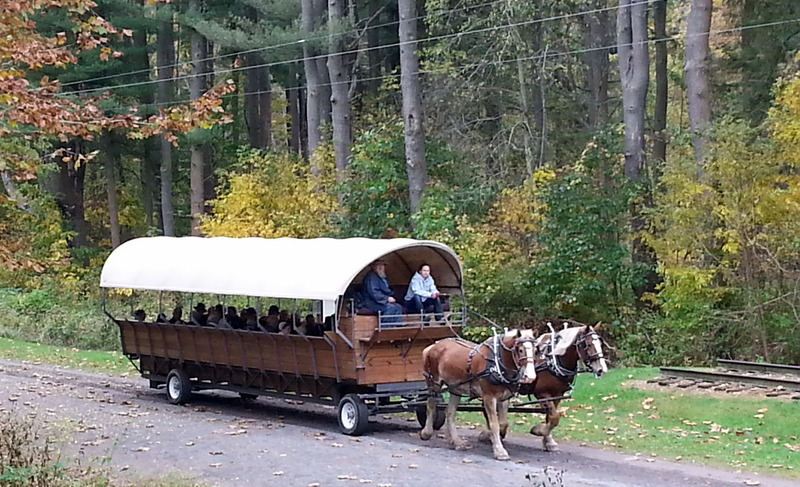 We drive to one of the many access points, and roll on to the gravel trail, just in time to see two huge wagonloads of Amish tourists enjoying the views. We pedaled about 17 miles down the Trail, enjoyed a spot of lunch sitting on the steps of an 1860s church, then turned around and headed back. 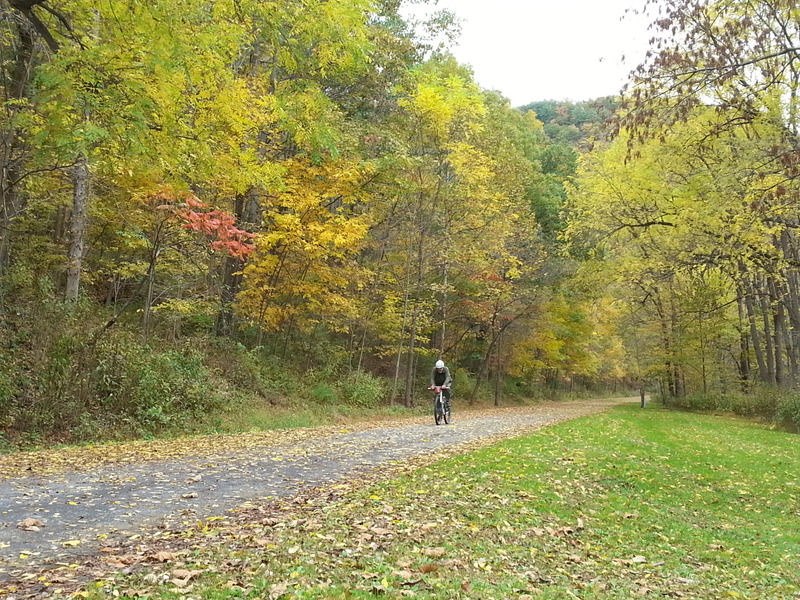 Along the way, we encountered a few other cyclists, but mostly we had the Trail to ourselves. Fine with us! My big discovery for the day? 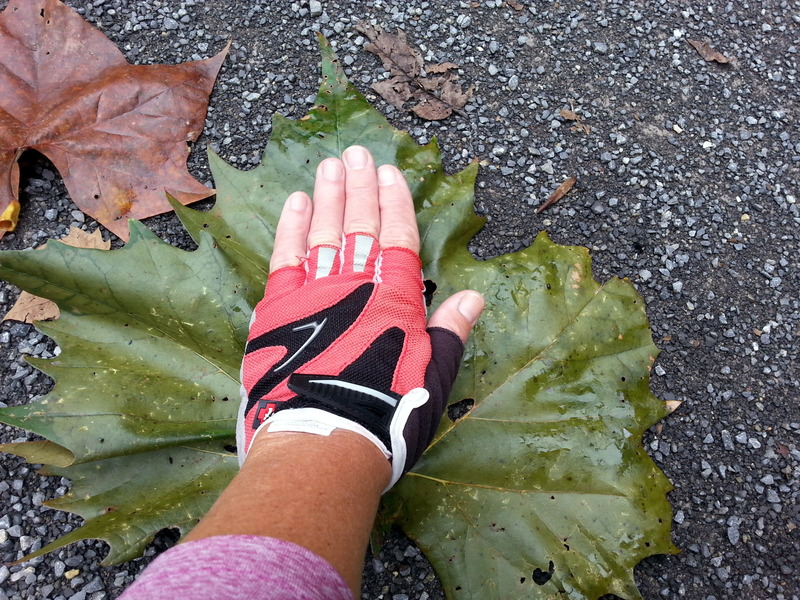 These enormous maple leaves (Acer Giganticum?). They were twice as large as my outspread hand. It’s been ten days since we wandered out of civilization. Time for a bit of urban camping – we’re anxious to read a newspaper, catch up with friends and family, and visit a brewery. Heading to Harrisburg. There’s been a whole lotta campin’ going on since the last post. Without any real plan in mind, we poured over our maps, and pointed the Firetruck toward the Catskill Mountains. 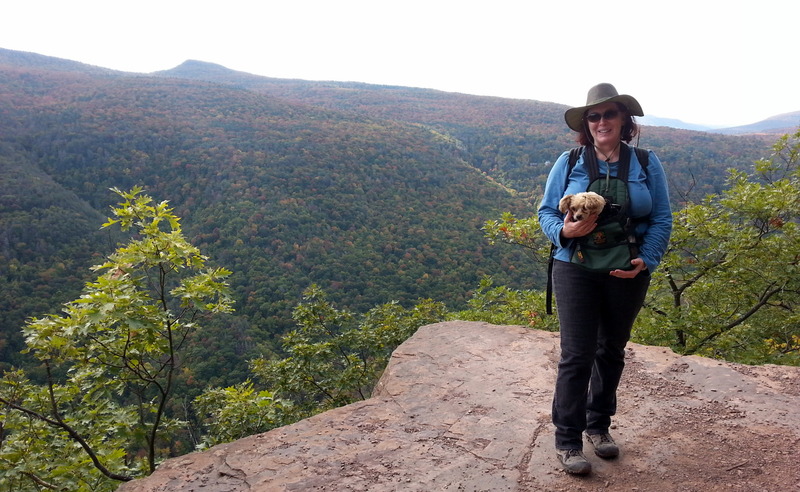 Less than 150 miles, and abundant hiking. We’re off! Needing firewood, we stop along the way at a place where there’s a guy with a chainsaw and a sign that says, Lumber, Mulch, Firewood. He promises to cut us $25 worth, so we set about re-arranging the back of the truck to accommodate the load. That’s a HUGE pile of firewood – we wind up stacking some in the back seat with Jezzy, who is less than pleased to share her space. Planning usually pays off. 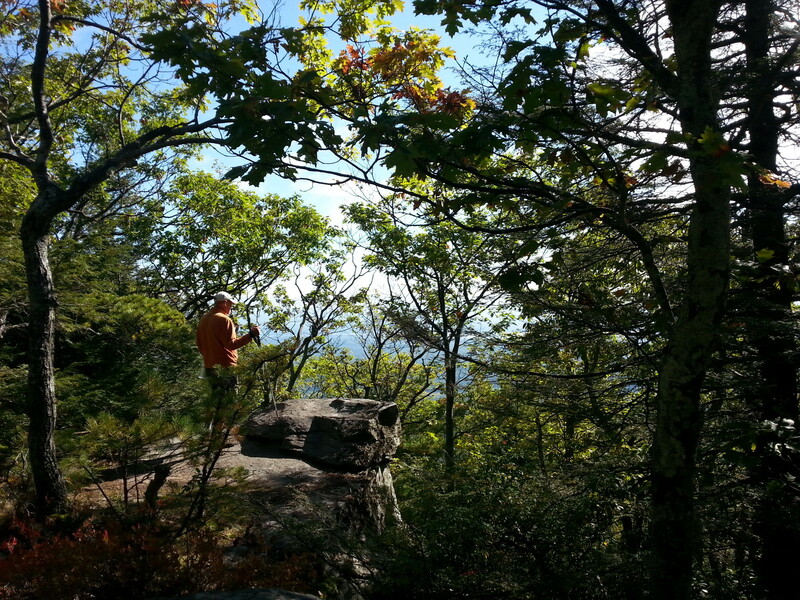 Our sights are set on a particular campground that’s close to Hunter Mountain, where we want to hike. 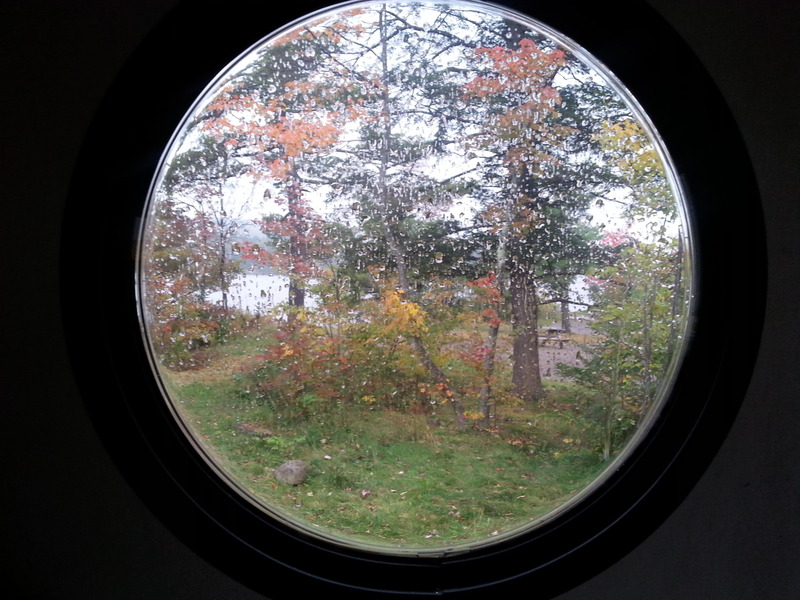 Oops – Closed For the Season! Picnic tables stacked up, gates over the drive. Fortunately, there’s another one fairly close. 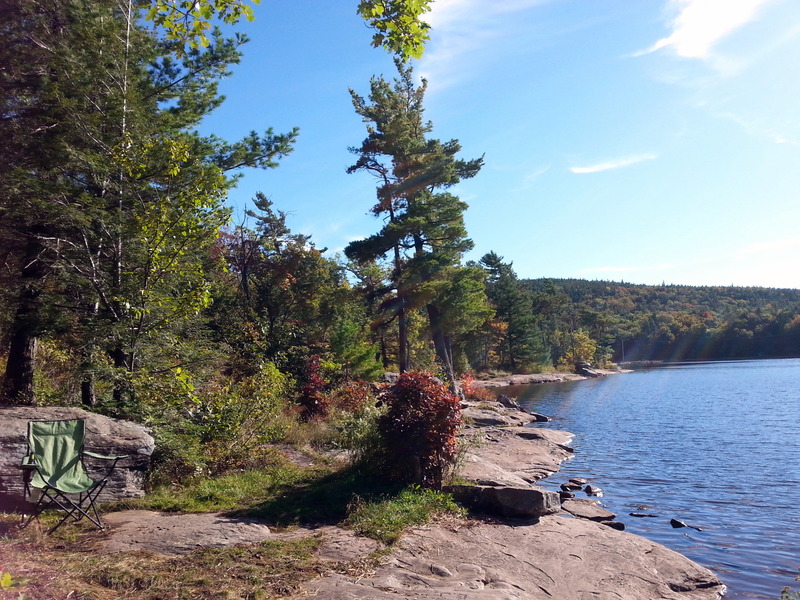 The camping gods must have smiled on the Campshaws that day, as we rolled into North South Lake Campground, one of the finest spots we have ever camped. 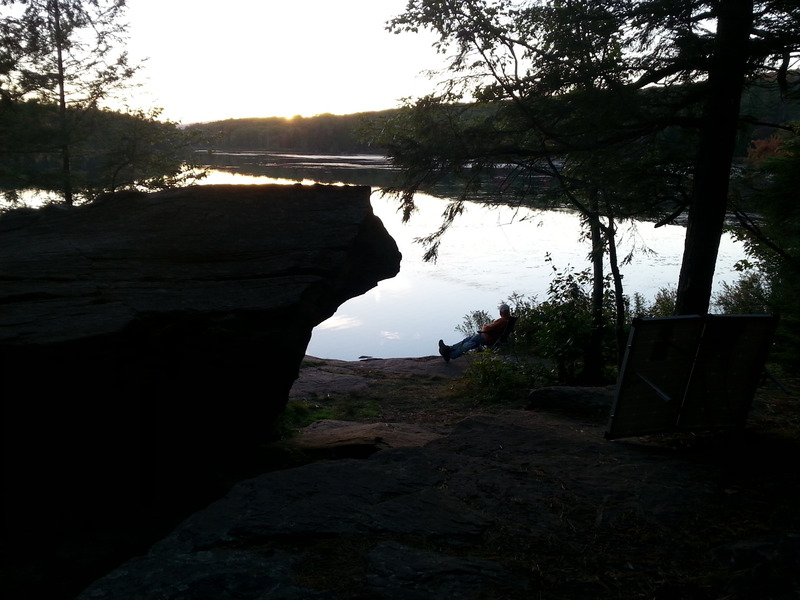 There are only a few sites available for three days, but the Rangers found a gem of a spot for us – on the lake, with our own private rock patio. The big stone firepit is another bonus. 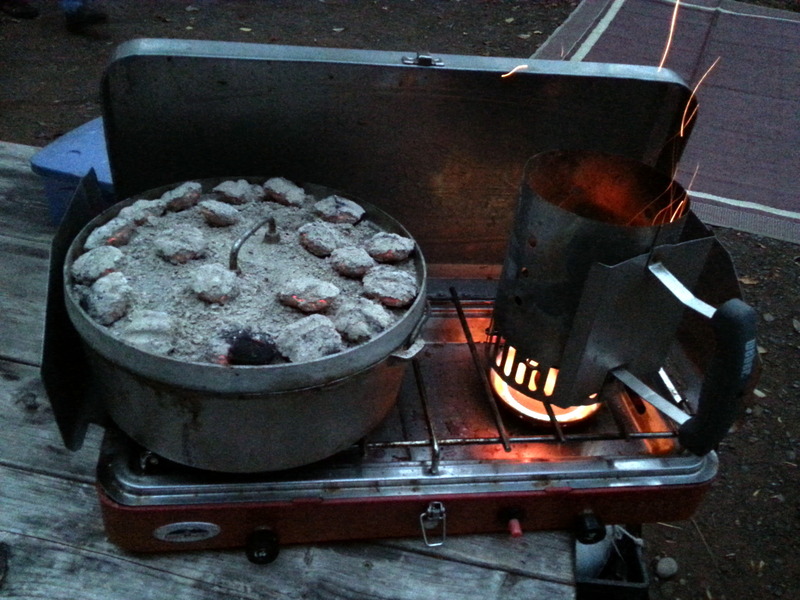 We love to cook Dutch Oven style (modified to Campshaw-style), and we we whip up a huge batch of stew. Only drawback? It’s very shady, which makes it tough to deploy our solar panel. There’s no electric or water at the sites here, and we need a solar boost to keep refrigeration running. John reels out all the cable we carry, so that we can just reach the afternoon sun by the lake. Eh, we’ll manage. 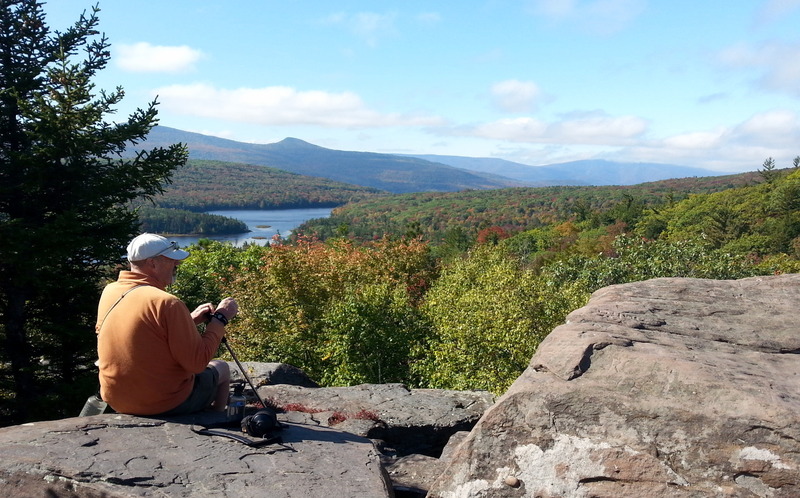 In three days, we hiked miles thru the High Peaks area of the Catskills. 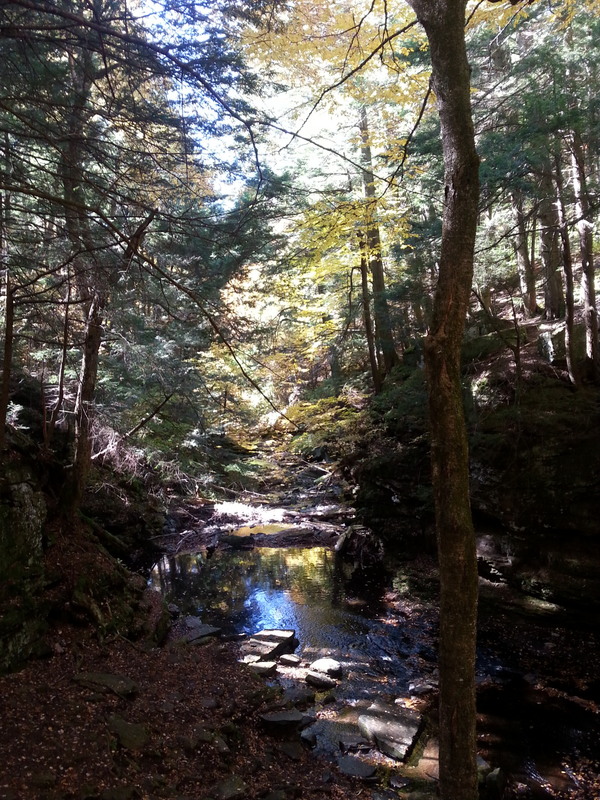 There were waterfalls, vistas, and shady glens. 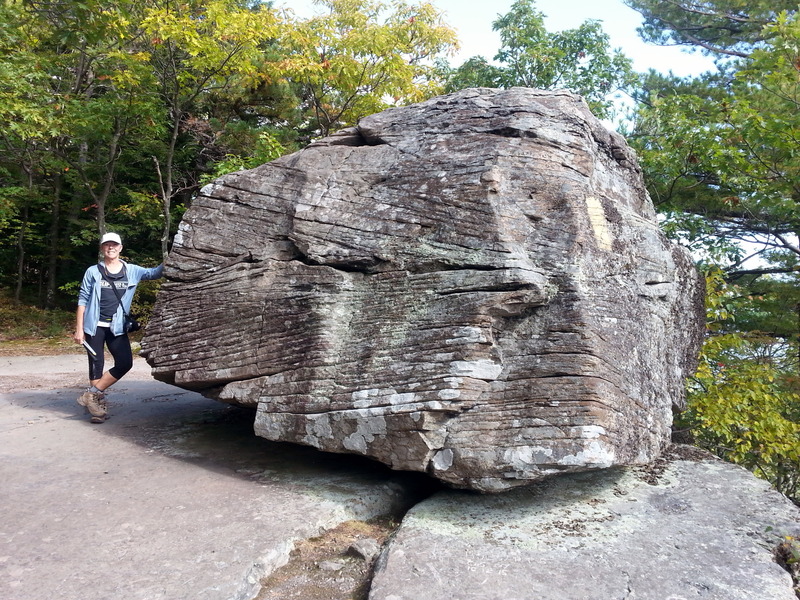 We admire Sunset Rock (both of them! 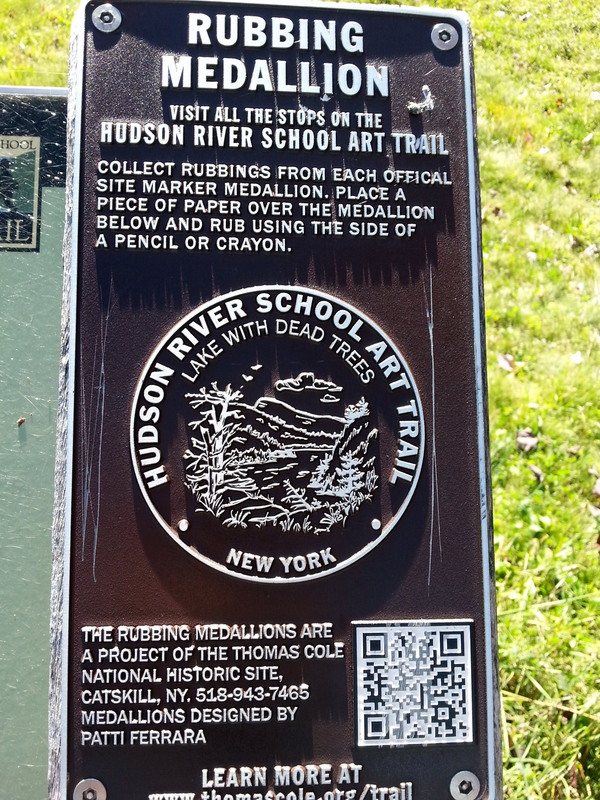 ), and Artist’s Rock, and had some spectacular views of the Hudson River. Lunch at North Point. 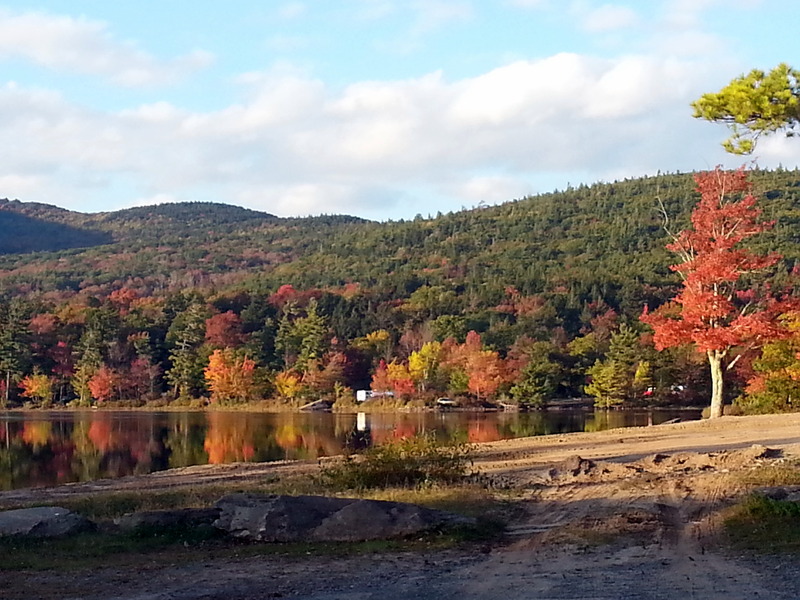 Only a bit more fall color could have enhanced the first two days. After three nights, we had to move to another campsite, as the one we were currently occupying was reserved for the rest of the week. Again, we lucked out and got a nearby (full sun!) site for two more days. Of course, it rained, so half of the time, it looked like this….. We stuck up a conversation with our neighbor Suzanne, and she and I, along with her tiny dog Zoe, decided to hike the next day, while John rested his aching feet. Peak color was rapidly approaching, and we had a terrific hike, even though we took a wrong turn (maybe two or three), and ended up hiking nearly 9 miles. This huge erratic (the name for a boulder seemingly dropped out of nowhere, but actually left behind by the glacier) was my favorite spot. 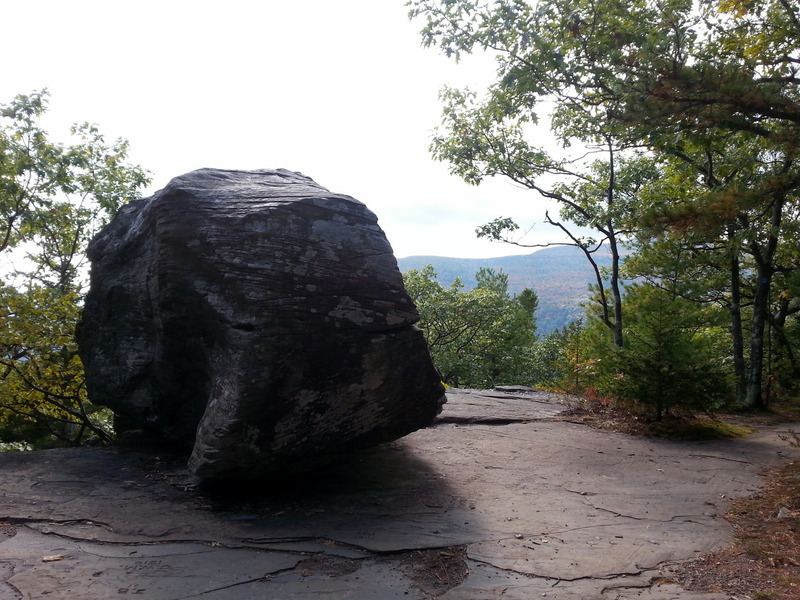 It was perched right on the edge of the cliff. Yep, that’s me – a rare photo! 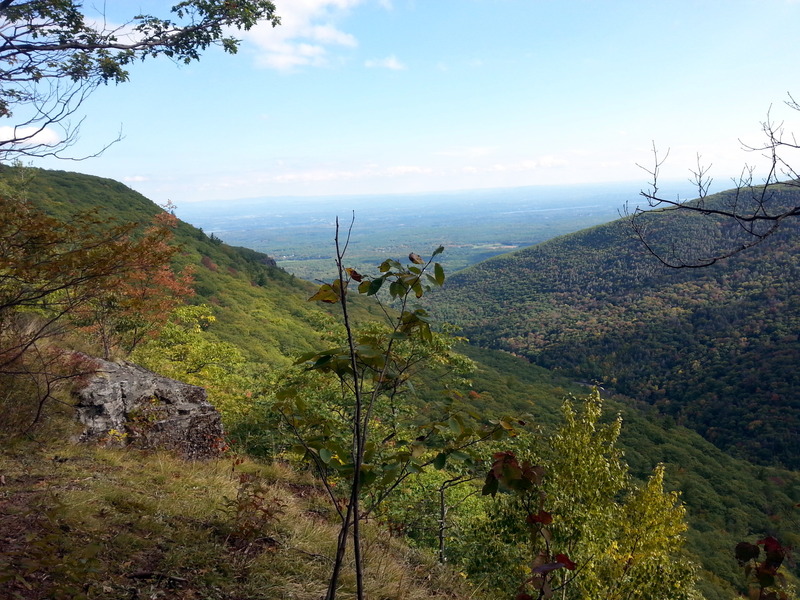 Our hike took us along the edge of the mountain, so we had great views of the valley. But, boy, were we happy to wander back into camp. You can just see the Fireball on the right edge of the photo. 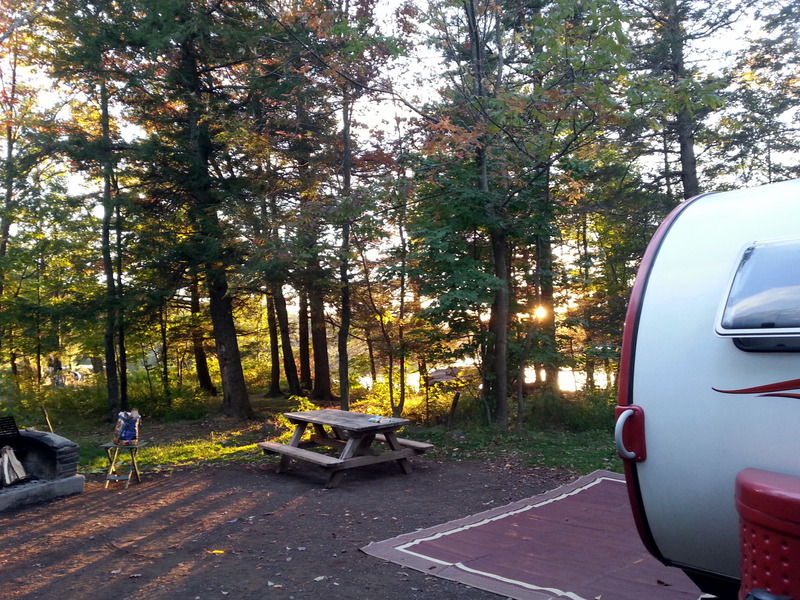 All sites were reserved for the weekend, so we moved on to Mongaup Pond Campground, located in the southwest end of the Catskills. On the road, we use Google Navigation for guidance. Let me just say this – if you are ever in the Catskills, and The Google tells you to turn on Blue Hill Road – DON’T DO IT!! We were rolling along, enjoying a rolling scenic drive when we made the fateful turn. It seemed odd, but we went along with it – we had no signal to bring up our Google map to check, and these small roads were not on our paper maps. So, we made the turn. Yikes! This narrow, leaf-strewn road went from paved to gravel. So steep that we started to lose traction on the leafy surface. There were a few white-knuckle moments before we finally got to the top of that impossible hill. We got the hell out of there are quickly as possible, and wandered into a little town. 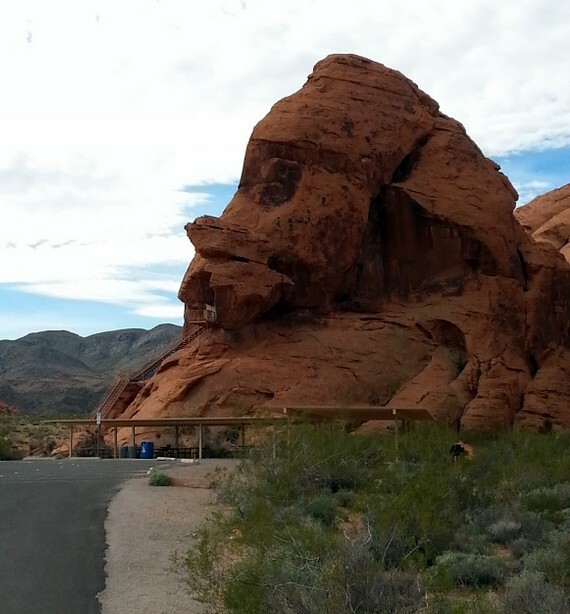 We knew we were fairly close to the campground, but could NOT figure out how to get there. Still no phone signal. Grrrr. But, along comes a geezer with a paper county map. Saved! Mongaup Pond was nice, but LOUD! 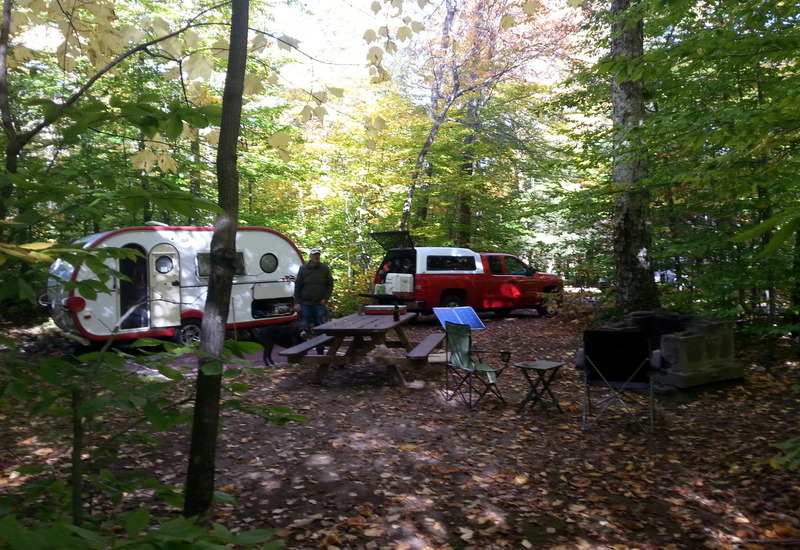 Smaller campsites, crammed with campers. Still no electric, and really no chance of any solar boost. No phone signal, and just one scratchy AM radio station. 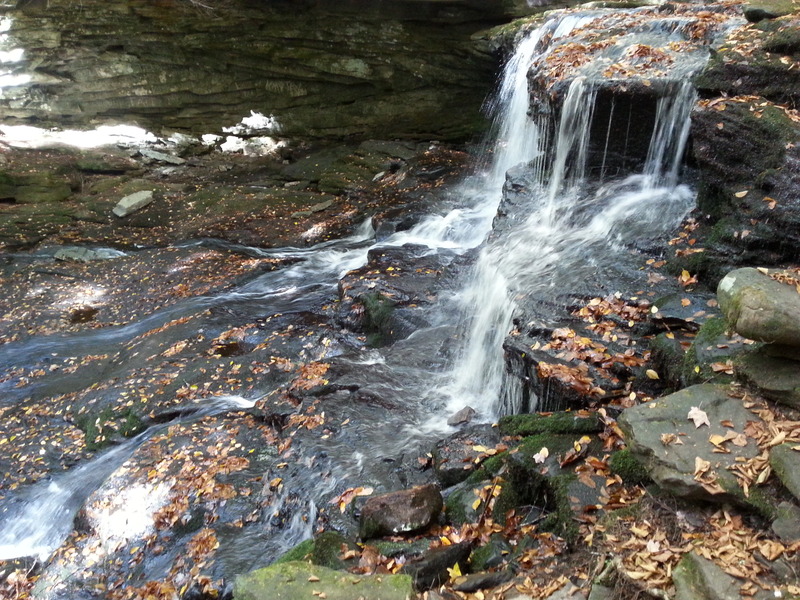 We explored a bit – found a waterfall, but not the beaver dams we had heard about. Bummer. 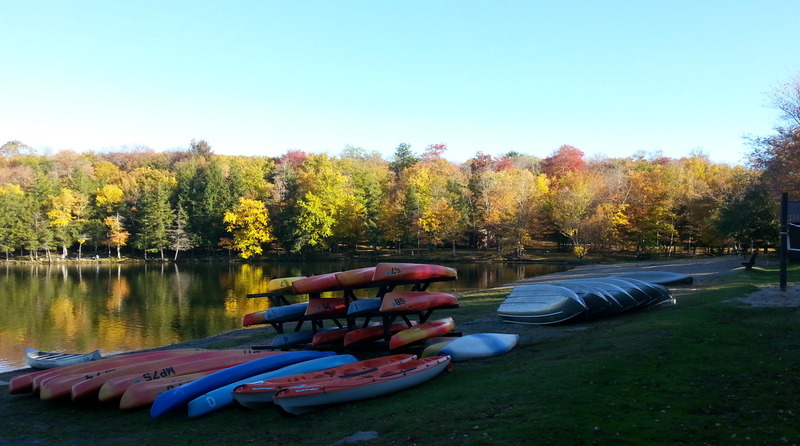 But, now it’s the end of camping season in New York. On Columbus Day, crews move through the park, tipping up picnic tables and tidying up the park for the last time. Guess that means it’s time for us to move along…. 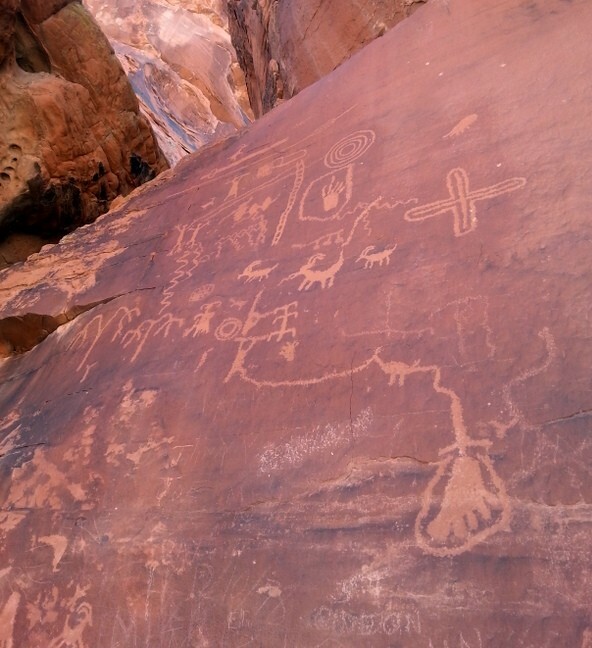 Are we excited to be exploring the great National Parks of the southwest? You bet! I’ve wanted to see these sights since I learned to read. John and I visited Zion National Park a few years ago as tent campers, tagging a few days onto an epic Las Vegas cycling trip. These next few weeks will take us to places we’ve both dreamed of hiking and biking. So, if you are a reader of this blog who doesn’t know me/us well, you’ll have to put up with the oohs and aahs of these first-time eyes seeing the sights. They are genuine. 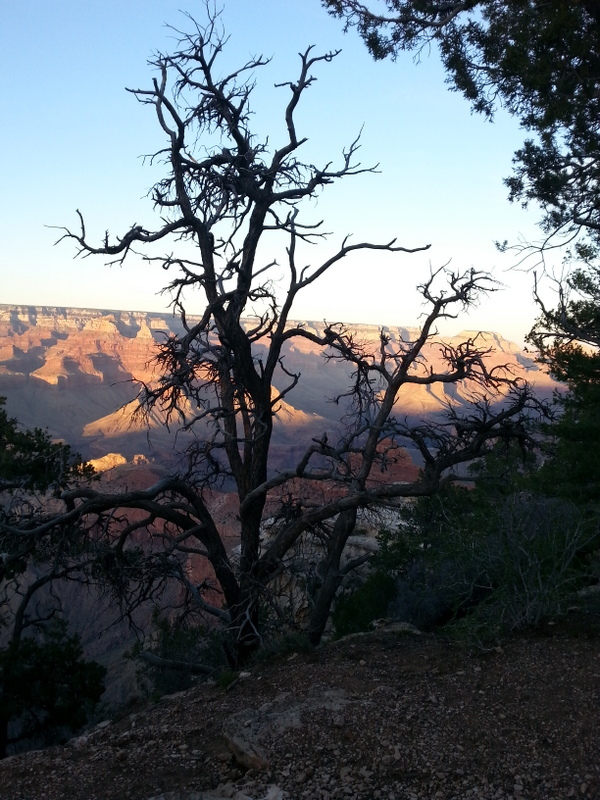 Four days in Grand Canyon, camping in Mather Campground are a glorious start to this adventure. We’re at 7200+ feet elevation, and it’s March. But, the weather is fantastic!! Last year at this time, we had reservations, but really cold temps scared us off. This year, we’ve got more T@DA experience, and are unfazed by potential freezing conditions. 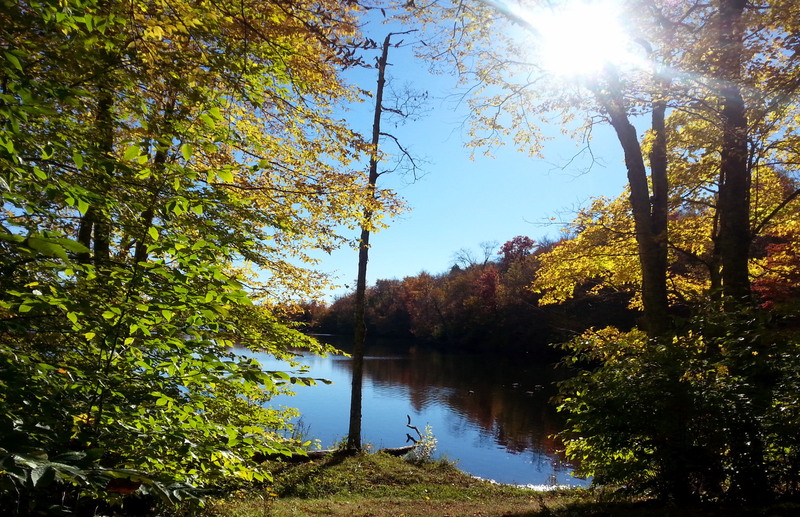 Cold nights are tempered with campfires, and bright sunny skies bring temps into the 60s. Totally unexpected, and very welcome. Our solar system is cranking! Mather Campground is beautiful. 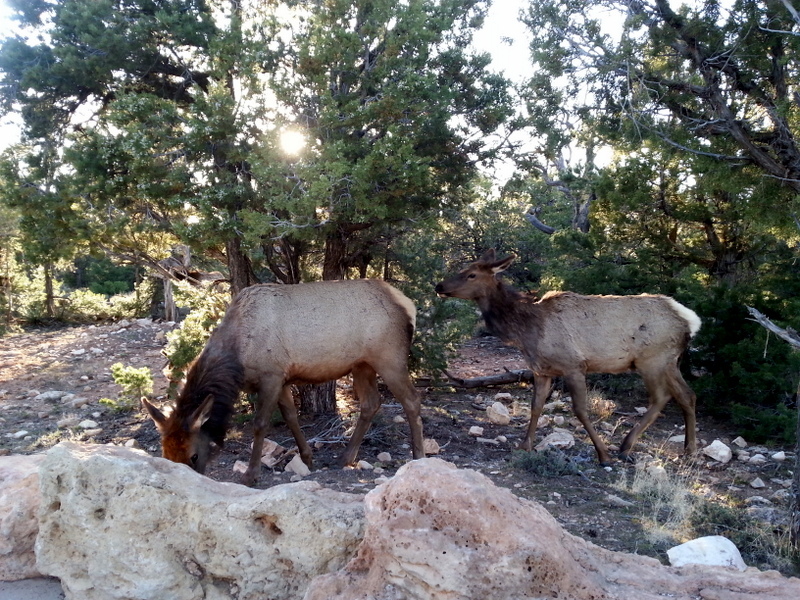 Elk roaming everywhere! Campsites are large, bathrooms are adequate. There’s a sparkling-clean laundry and busy coin-op shower facility nearby. No electric service – water nearby. 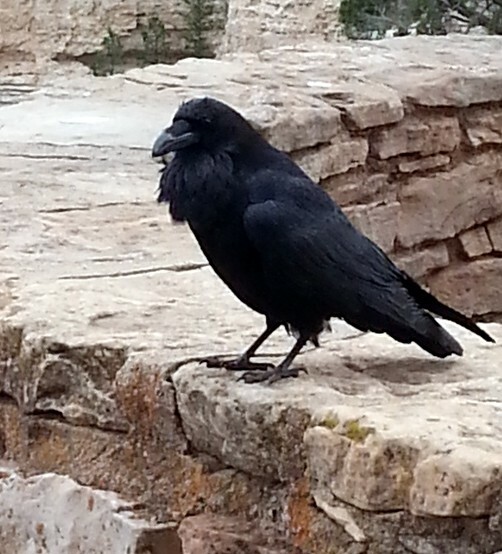 Enormous ravens. 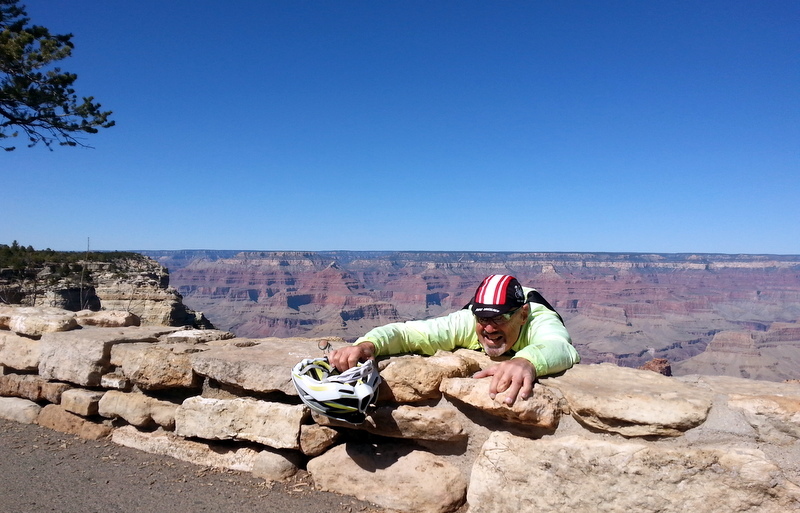 We cycled from the west end to the east end of the pavement at Grand Canyon, stopping at every single lookout point to examine a new view. Hermit’s Rest at the far west end. 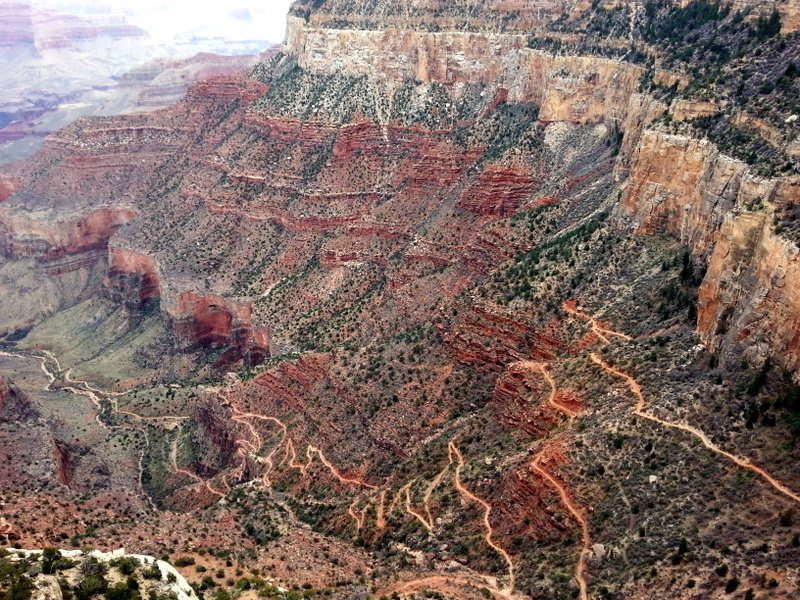 We spent one day was spent hiking 4.5 miles down Bright Angel Trail to Indian Spring, along with the 4.5 mile trek back to the rim.Here’s the view of the Trail from the Rim. 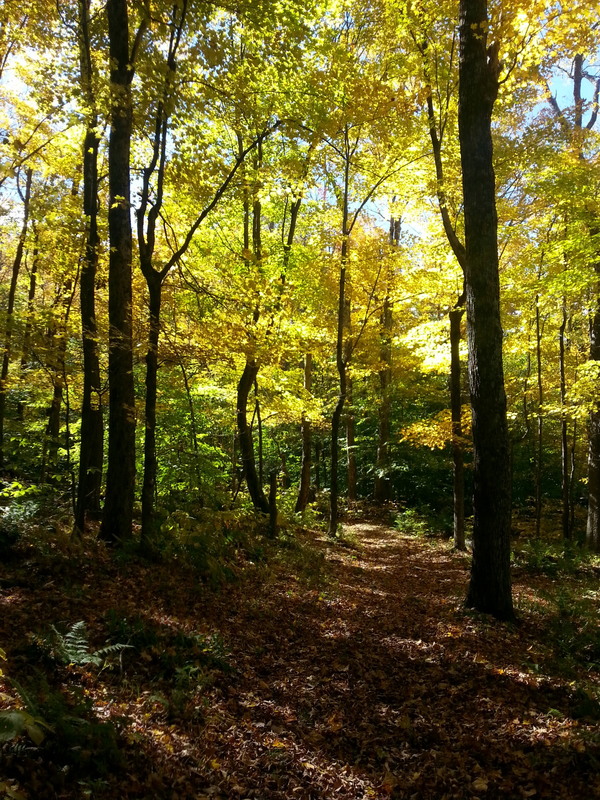 Along the Trail, we encountered incredible beauty. 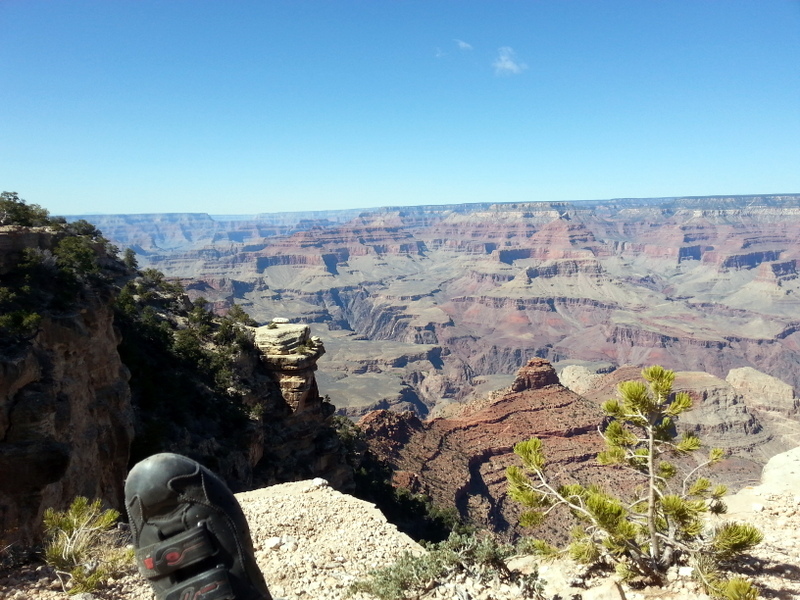 One thing that’s incredible to comprehend is that we are allowed to stroll along the Canyon Rim with a mere 4″ wall separating us from the abyss. There’s (mostly) no fence or obstruction to keep one from stumbling or jumping off the edge. It’s just a matter of how brave you are – I’m not so brave – my toes are 3′ from the edge here…..
John is a bit more brave. He did manage to crawl back over the wall. Our last night in camp (Saturday) was the day before a full moon, so we decided to hike back to the South Rim to see the Canyon in the moonlight. It was amazing. 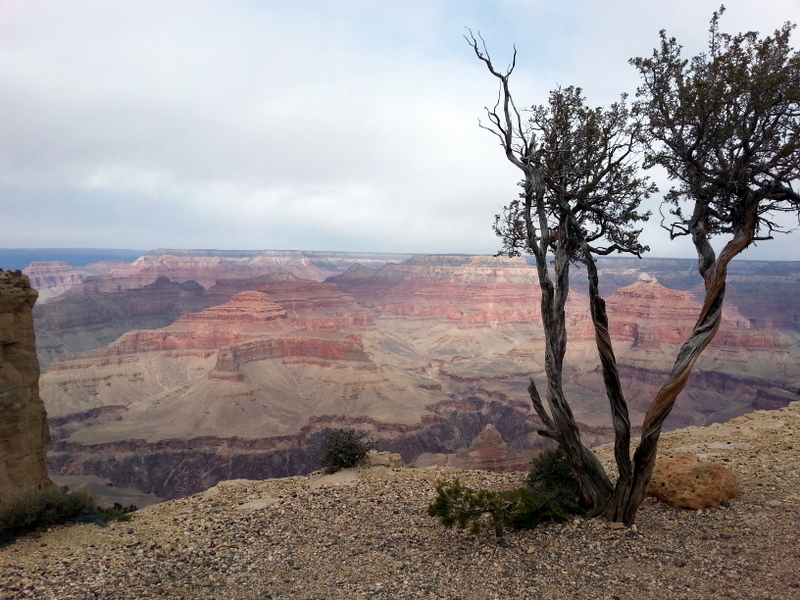 We saw only a handful of other wanderers in our 4-5 mile stroll from the campground along the Rim Trail. 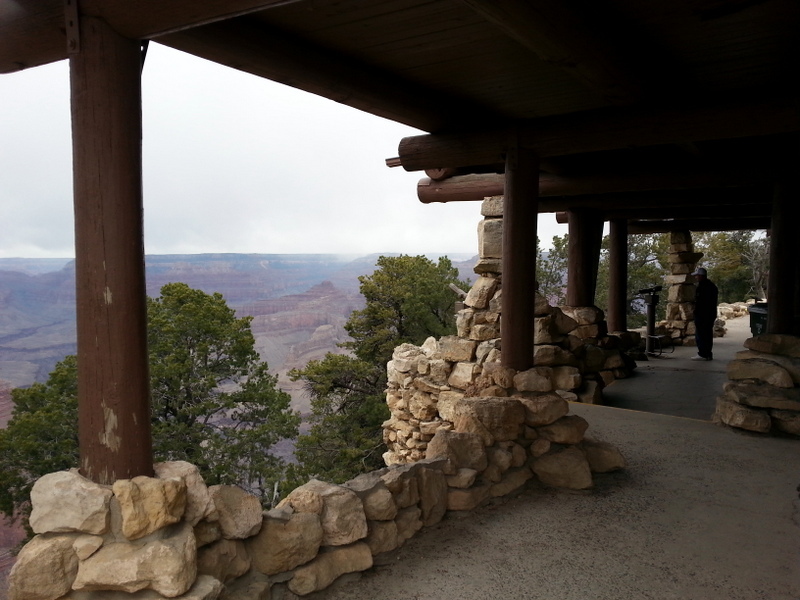 The distant rim of the Canyon was bathed in eerie moonlight, and the western edge of the south rim was dotted with amber lights from the hotels. So quiet. As our eyes became better accustomed to the dim light, we could pick out a few distant campfires and see lights from Phantom Ranch, at the bottom along the Colorado River. It was a special evening. Too dark for photos, although I did make several attempts. 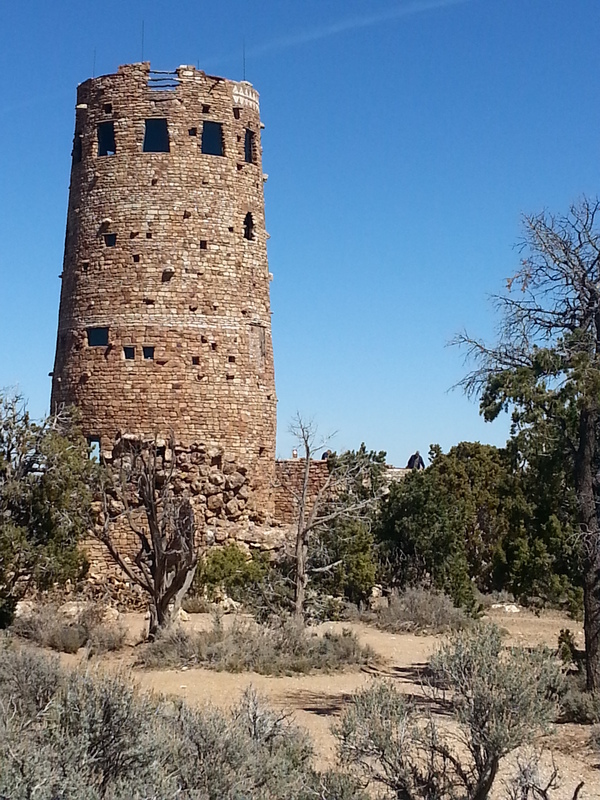 We took our time heading out on Sunday, making sure we stopped at every lookout heading to the East exit of the Park. 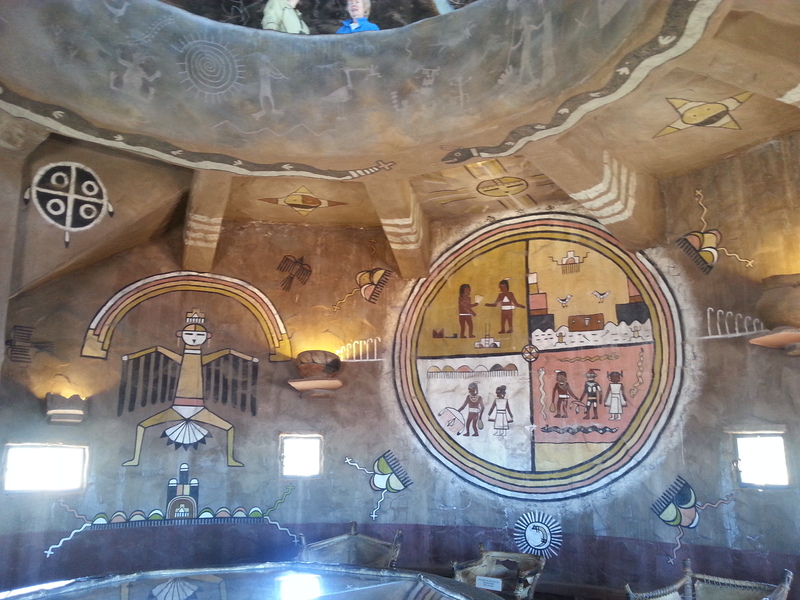 The Desert View Watchtower with its Hopi murals was moving, and a spectacular last glimpse. 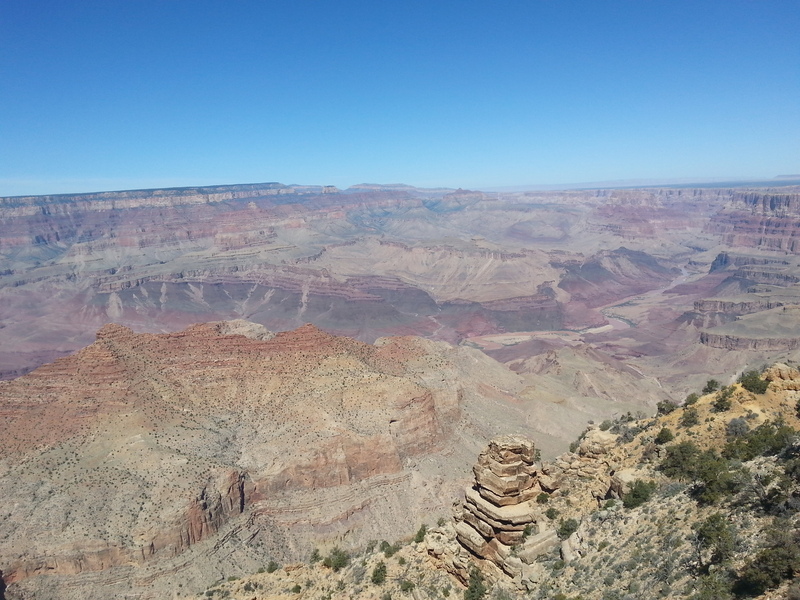 After believing that the Canyon goes on forever, it does melt into the Painted Desert. 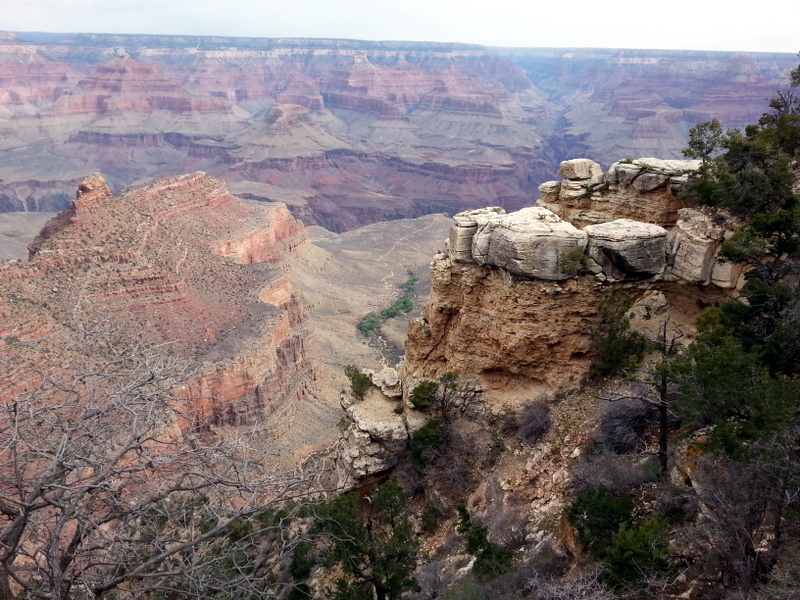 You’ve probably all seen wonderful photos of the Canyon. My camera cannot possibly capture what my eyes took in. More than a view, it’s an experience. 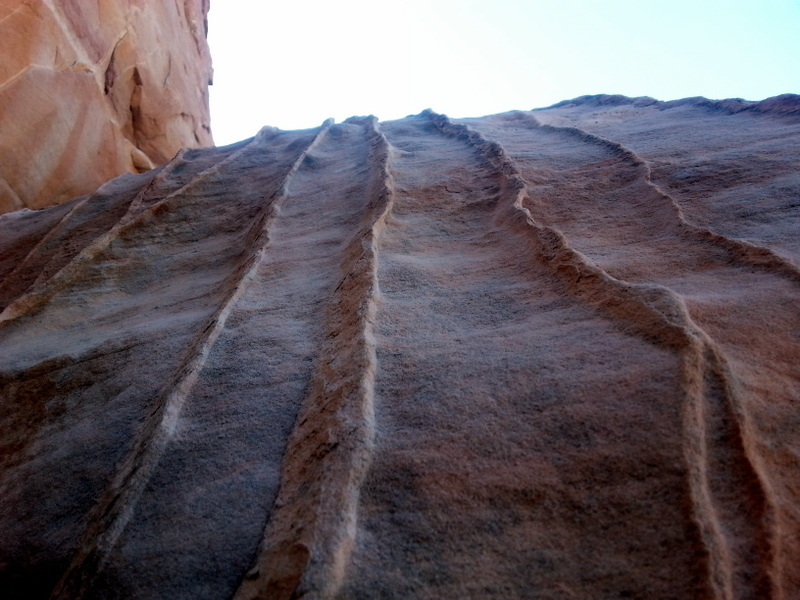 Our four days were Grand Canyon 101 – a light scratching of the surface. So much left to explore. Posted this from Zion National Park, where we are camped for the next four days. WOW, already! 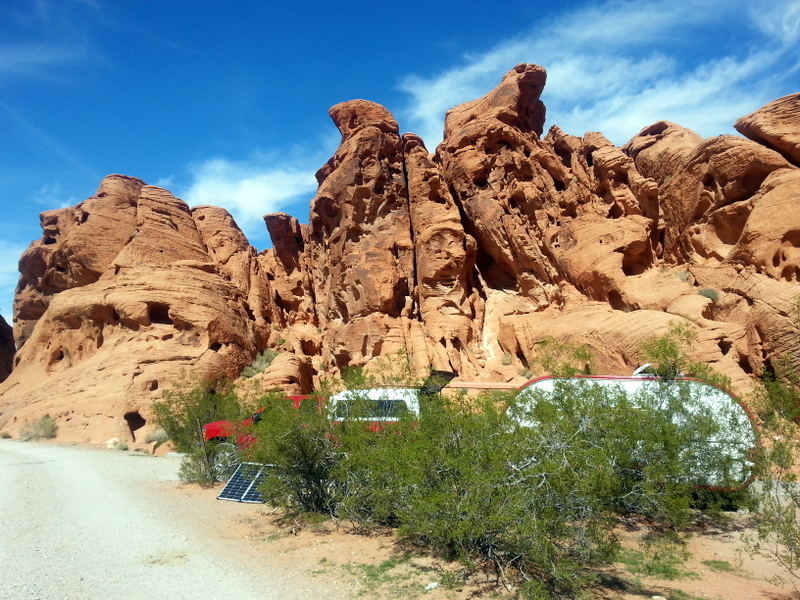 Is it possible to have too much camping surrounded by red rocks with bright blue skies overhead? A resounding NO! Perhaps our Michigan white-sand backgrounds are coming back to bite us, but we are entranced with solitary off-the-grid camping in the desert Southwest. 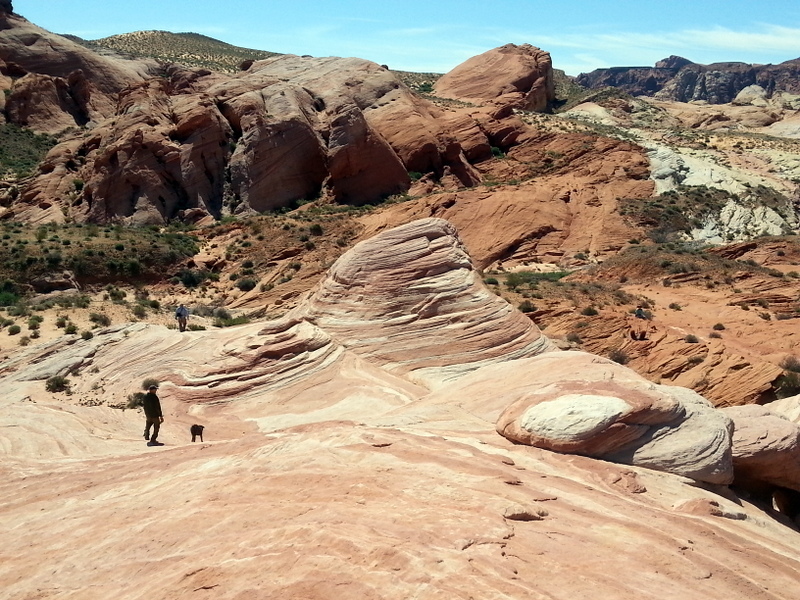 After leaving Las Vegas, we headed to Valley of Fire SP, about 50 miles north for a few days of quiet camping. Due to a nearby NASCAR event, we found the campground fairly crowded, but managed to find a spectacular, secluded site in the primitive area (no electric, pit toilets, bring in your own water). Right up our alley. What better place to deploy our new 120W solar system (you can see it in the photo). It kept pace with our power needs for three days. 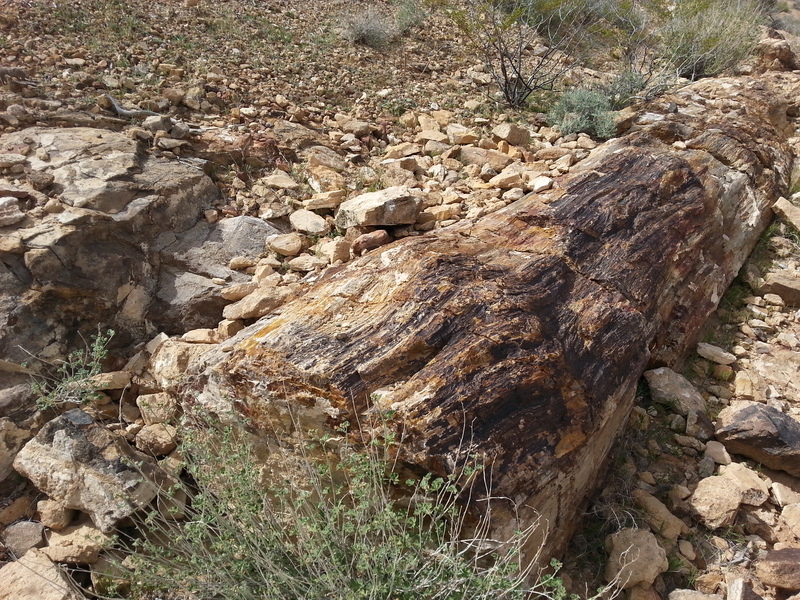 and admired petrified logs and unusual rock formations. 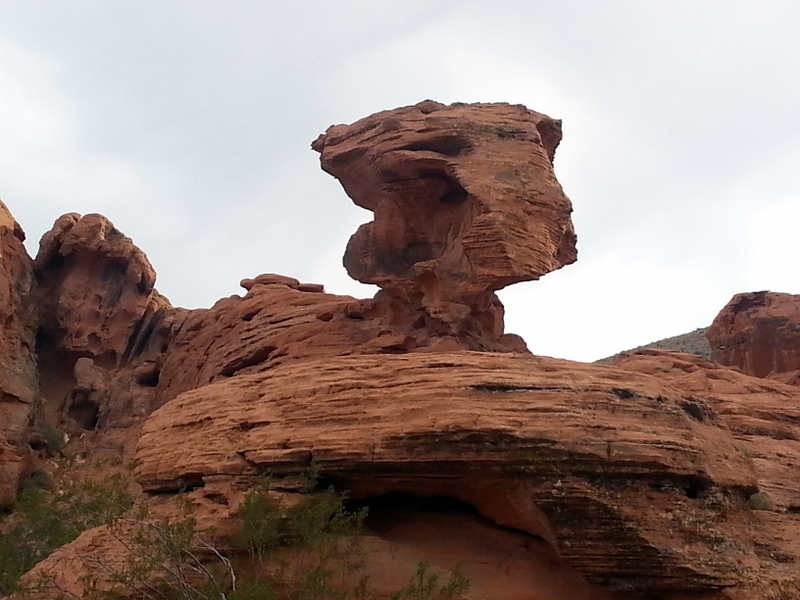 The best red rock formations earned their own Campshaw nicknames. 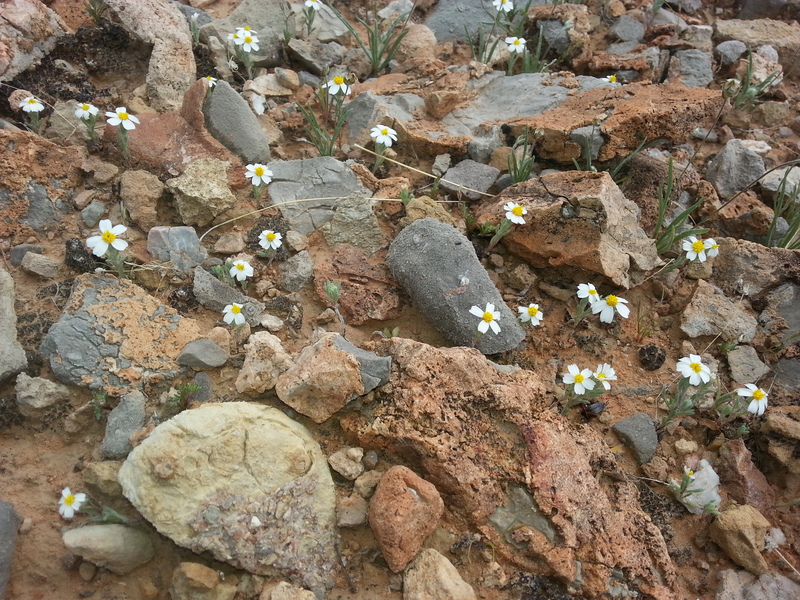 The scrub Nevada desert was beginning to bloom. Tiny flowers everywhere. Bare windswept rocks, some with mysterious stones piles atop. 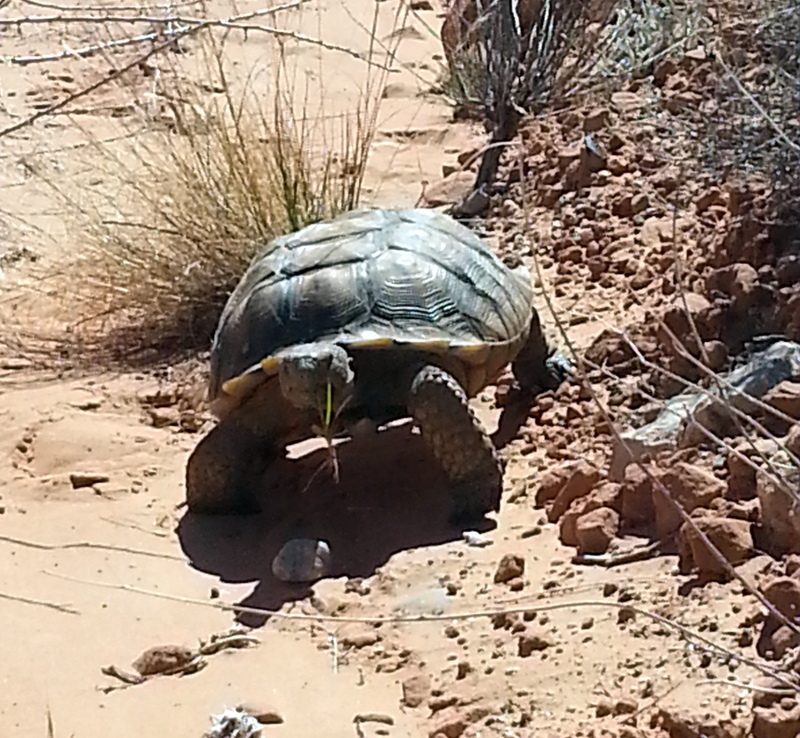 But, the best of all was the desert tortoise we came across, carrying a grass snack to an unknown destination. 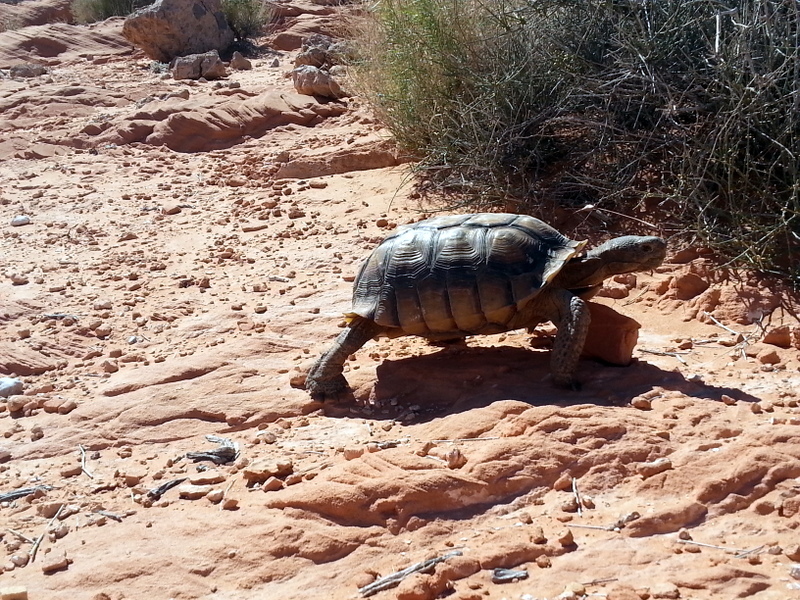 He resolutely passed me, and headed off to his home somewhere in the desert. Never thought I would see one of these endangered tortoises, and feel incredibly lucky to have been in the right place in the right time. 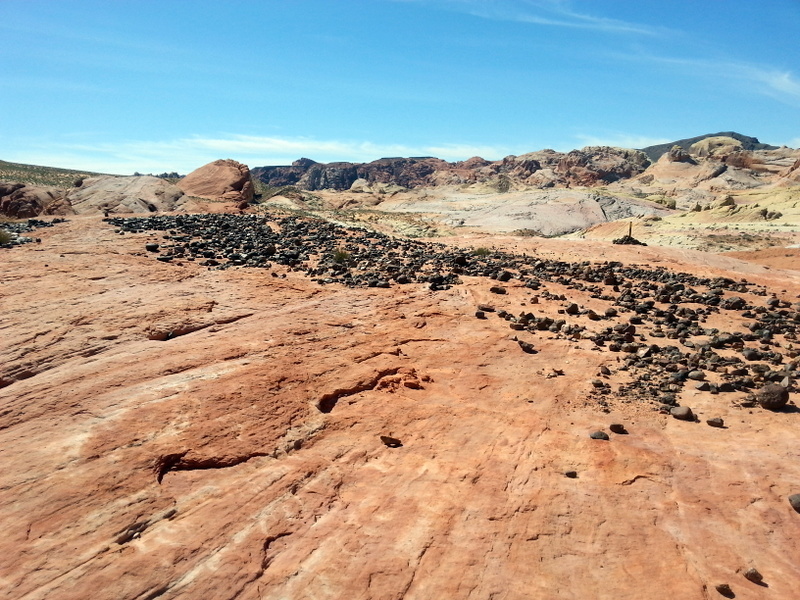 The best things in Nevada aren’t all about casinos and money.